Ian Carson is the co founder of SecondBite. Formally established in 2005, SecondBite was the idea of Ian and Simone Carson who decided they could no longer watch good food go to waste while people went hungry. 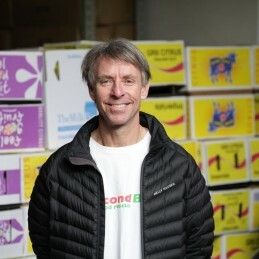 In its first year, SecondBite was run by just three volunteers in Victoria and moved just over 600 kg of food. Since then, the Melbourne hub has grown at an astounding rate with the generous support of volunteers, donors, and supporters alike. Now the national headquarters for the organisation, the Kensington warehouse operates with five vans, one truck, 23 staff and over 600 volunteers. Ian is routinely sought out by boards and governments requiring discreet advice and solutions around complex negotiations or sensitive issues.For over 30 years he has been instrumental in turning around organisations and helping clients to protect their assets and reputations. Ian is renowned for his lateral thinking and developing pragmatic solutions to intractable commercial problems, such as the settlement for Australian thalidomide victims. Ian led the PPB Advisory team that assisted the settlement negotiations. Ian developed the Governance Management Assessment Scorecard which assesses risk in governance and management. The scorecard is currently being tested by Melbourne University. Ian has led major reviews of financial organisations including the ANZ Security Lending Review and Cabinet Level Reviews for Government. Ian has rescued numerous companies facing cash flow stress by working closely with stakeholders to garner support and to put businesses on a sustainable footing. Many of these businesses continue to employ thousands of people. Ian is focused on helping businesses grow through revenue improvement strategies, capital raisings and mergers and acquisitions. Ian supported David Boykett in establishing the David Boykett Tall Ships Voyaging Fund. This fund provides places for disadvantaged youth to work with teams on board tall ships and help them improve the way they work in society. In 2015 Ian with his wife Simone were named Schwabb Foundation Global Social Entrepreneurs of the Year. Ian was also the recipient of the Southern Region (Australia) Social Entrepreneur award as part of the EY Entrepreneur of the Year 2015 program.